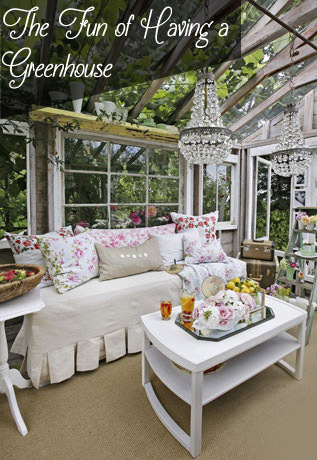 I love to garden and always wanted my own greenhouse. Never happened. Maybe because I didn’t just want a greenhouse, I wanted a greenhouse getaway. A place to escape to and enjoy tropical ferns, the fragrance of clean soil, cute pots and little seedlings popping their way to the surface long before Spring. White benches to sit on with cute Georgia plantation cushions. And a cat. I picture a cat, a large cat, curled underneath a potting bench amongst flats of Impatiens. Yes!